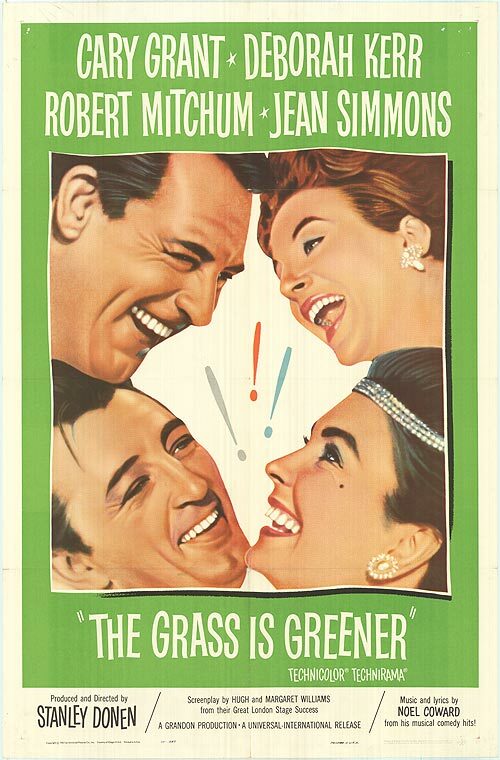 The wife (Deborah Kerr) of a penniless lord (Cary Grant) becomes romantically involved with a wealthy American (Robert Mitchum) who arrives as a tourist at their estate; but despite attempts by Kerr’s friend (Jean Simmons) to fill Grant in on details of the affair, he remains strangely calm. The enticing cast of this would-be romantic comedy — directed by Stanley Donen, and based on a 1956 play by Hugh and Margaret Williams — is the best thing going for it by far. Its insipid storyline is based on a paper-thin premise which never feels believable: Kerr is apparently reasonably happily married to Grant, yet falls into a passionate embrace within 20 minutes of encountering a stranger who’s barged into a private room of her estate. (If her husband were played by someone less attractive than Grant, this scenario MIGHT be a tad more plausible — but as presented here, it’s simply ludicrous.) Meanwhile, the annoying character played by Simmons is completely gratuitous, and seems to be added into the mix simply to round things out and provide one more pretty face to look at. Feel free to skip this clunker unless you’re a diehard fan of one of the actors, and feel compelled to see them in everything they completed. By all means skip this turkey – it’s a real dull dud. ’nuff said.